Logic Pro X to deliver a better audio recording experience and help you focus on creating music. DualPath Monitor mode allows Logic Pro X users to effortlessly setup and control linked instances of Apogee FX Rack plugins that run on Apogee hardware DSP and natively in Logic Pro X for near-zero latency recording. 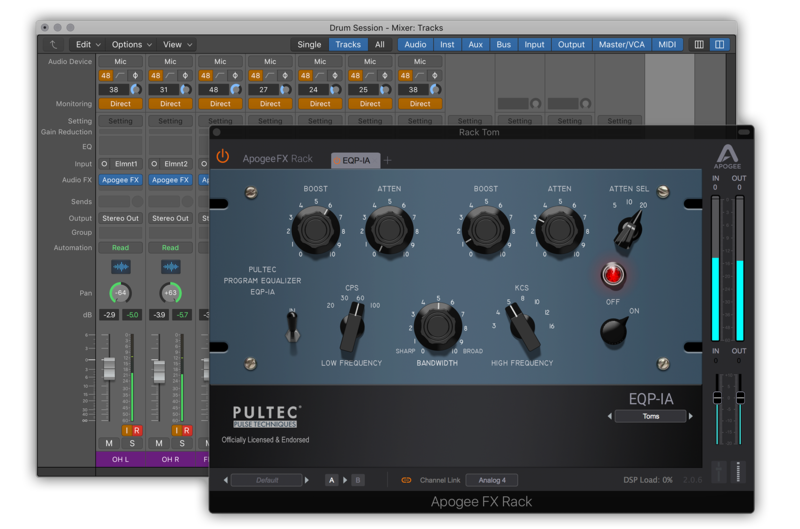 Setup happens directly from the Logic Pro X Mixer window when you add an instance of Apogee FX Rack and link it to Apogee hardware. Direct monitoring is the key to eliminating latency during recording. 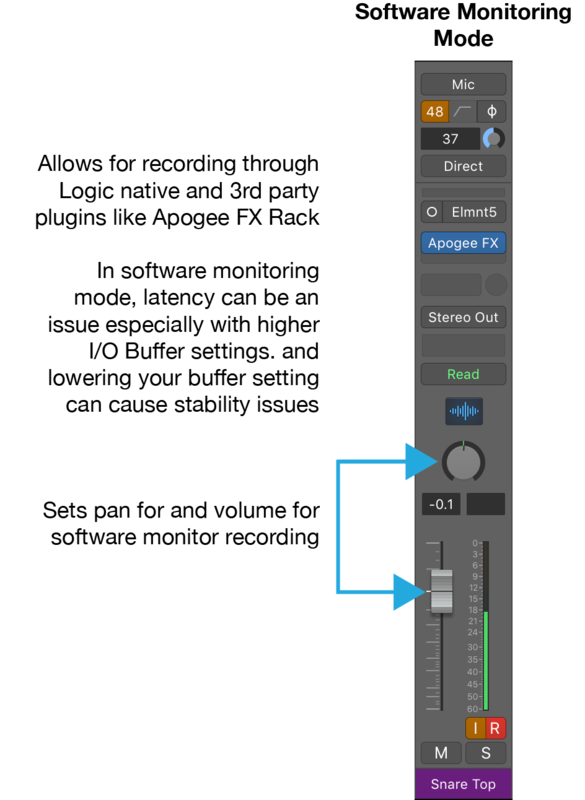 Pressing the magical “Direct” button in Logic Pro X sends your monitoring signal directly from the inputs of your Ensemble or Element interface, bypassing any I/O buffer or plug-in induced latency. This also lets you maximize your I/O Buffer setting and processing potential while maintaining the lowest latency. The Channel Strip fader and pan set either the direct monitoring or playback settings without the user even being aware of two signal paths – it happens automatically and transparently based on the Channel Strip status. 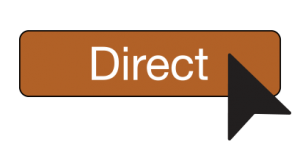 The Apogee-exclusive Direct button offers another important feature – the ability to set individual Channel Strips to one of two workflows, direct monitoring with plugins or software monitoring. 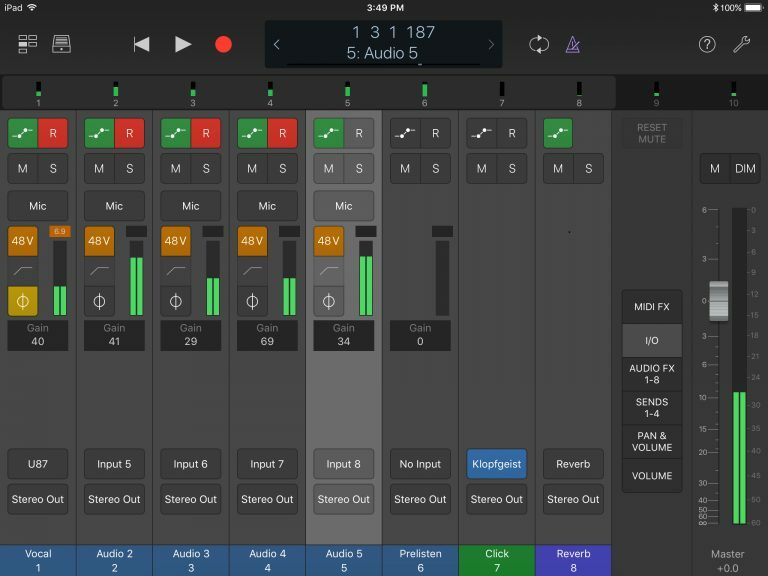 This makes it possible to record a direct-monitored vocal on one channel while recording a guitar through a software monitored virtual amp on another. If you are using an Ensemble Thunderbolt or Element series interface, you can adjust hardware input parameters directly from the Mixer view in Logic Pro X, including mic pre gain, input type selection, 48V phantom power, direct monitoring and more.